This "Historically Speaking" column was published in the Exeter News-Letter on Friday, September 12, 2014. 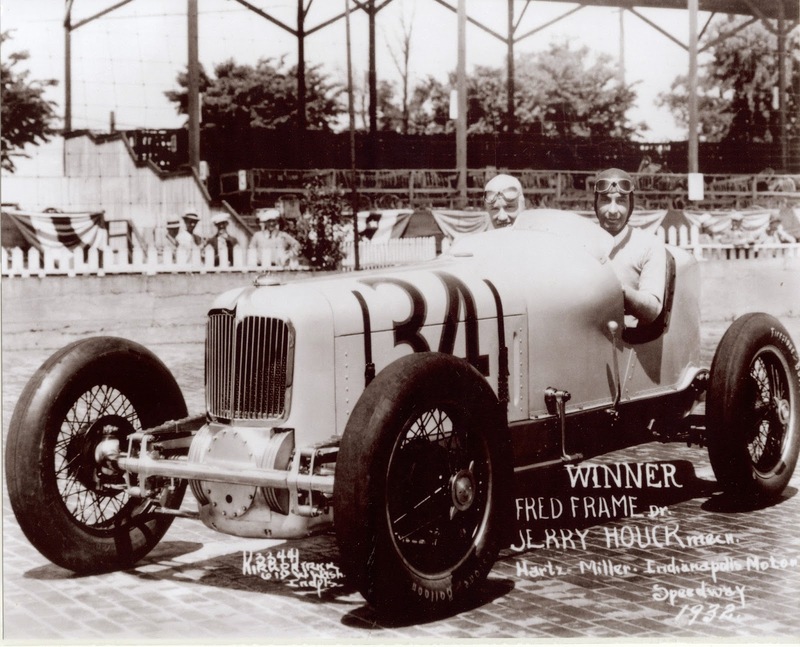 Race car driver Fred Frame always said he was born in Exeter, New Hampshire. When I happened upon a file about Frame in the Exeter Historical Society archives, I was surprised that I hadn’t heard much about the man. Frame raced to fame when he won the Indianapolis 500 in 1932, yet there’s little acknowledgement of that achievement in his native town. So, was Frame from Exeter? Or, was that something he simply made up? Frame is mostly associated with Pasadena, California – where he seems to have spent most of his life. The Exeter Frame family ties him to Charles E. Frame, who, it is said, served as his ‘foster father’ and was a well-known and respected cabinet and furniture maker. Perhaps, but no documentation connects the two as ever living together. The facts about Fred Frame’s early life turn out to be quite complicated. Fred himself filed only two documents that can be traced: his 1917 draft registration form and his 1915 marriage certificate. On both, he lists his date of birth as June 3, 1894, however, there is no such birth record in Exeter. This doesn’t necessarily mean he wasn’t born in Exeter. Babies were born at home in that time and sometimes they missed being noted in the town’s vital records. On his draft record, he lists his name as Fred William Frame, born in Exeter, New Hampshire, and currently working as a chauffeur for the very wealthy Charles F. Paxton in Pasadena. He was slightly more specific about his origins two years earlier when he reported, on his marriage license, that his parents were ‘C.J. Frame’ and ‘Issabella McClish.’ C. James Frame lived in Exeter in the 1880s, and can be found on the 1910 census living with his wife Isabelle and step-son Frederick in Pasadena. So C.James Frame was not Fred’s biological father. That honor goes to Frank Colbath, who was Isabella McClish’s first husband. Colbath died in 1904 at the County Farm after a lengthy bout of tuberculosis. Isabella Colbath and her son, Fred Colbath are in Exeter at the time of the 1900 census. Her elder son, Benjamin, was living with his grandparents in 1900. It was probably difficult for her to make ends meet as a dressmaker without the support of her husband. Sometime after the death of Frank Colbath, Isabella married C.James Frame and moved with him and young Fred to California. Fred must have liked the arrangement because he took his step-father’s surname and used it for the rest of his life. By most accounts, Fred was not much interested in school but was quite taken with cars. He chauffeured for a few years before taking up racing as a profession. His first Indy 500 was in 1927, when he placed 11th. The Indianapolis 500 was quite a different race in its early days. The event premiered in 1911, with the same 500 mile 200 lap race we have today, but the speedway was paved with brick, drivers had a passenger called a ‘ride-along mechanic’ and the cars looked like they belonged in a pinewood derby. But you won’t need a description, because the Indianapolis Speedway in 1932 has been immortalized in the Warner Brothers film The Crowd Roars. And, like a ghost from the past, Fred Frame appears in the film playing himself. Released in April of that year, Frame went on to win the Indy 500 on May 30th. He only gets a few lines in the film, but he delivers them well as he towers over Joe Greer, played by James Cagney. It’s not often that someone from our archives can be seen walking, talking and breathing, so it is quite a thrill watching him. The film can be rented and streamed over the internet through a well-known site that inexplicably has the name of a famous South American river. The 1932 Indy 500 broke speed records that had been set seven years earlier by Peter DePaolo, averaging 104.44 mph (for comparison, the 2014 Indy 500 winner, Ryan Hunter-Reay averaged 186.563mph). Although Frame placed well in the years that followed, at 38 he was old for a driver. His son, Bob, became the racer in the family after Fred left the track in 1939, after a particularly bad accident. Bob was later killed in a race in Owatonna, Minnesota, in 1947. Frame died of a heart attack at his home in Hayward, California, in 1962. There was no obituary published in his home town of Exeter, New Hampshire. According to the Nancy Carnegie Merrill index of the Exeter News-Letter, the only time Fred Frame was ever mentioned in the newspaper was in 1941, when a relative, Joseph LaFramboise, entered the New Hampshire Soap Box Derby. Fifteen-year-old Joe gets three columns including, “related to Freddie Frame, one-time winner of the 500-mile Indianapolis speed classic, LaFramboise finished second in the entire field in 1939, and last year reached the semi-finals before being eliminated.” Thanks. Nice that he got a mention. Fred Frame should be considered one of our home town heroes. Pass the word around. Image: Exeter native, Fred Frame (on right), winner of the 1932 Indianapolis 500.